Great Lent is coming, and with it, a wealth of the prescribed evening services. This Lent all our weekday evening services willbegin at 6.00 p.m. (rather than our previous 7.00 p.m. starting time) to facilitate families with young children attending these important services. (The Saturday Great Vespers will continue for the time being with its previous starting time of 6.30 p.m.) These services begin with the Great Canon of St. Andrew of Crete, on Monday March 18. 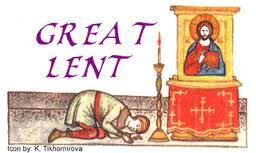 A couple of items about parts of the Presanctified Liturgy served Wednesday and Friday in Lent. Antiphons are another form of dialogue, in which lines are sung alternately between two different groups. In the Presanctified we do this with men singing one line, women singing the next. Which group begins will depend on the mix of choir singers we have on a given night, so listen for the choir to begin. Then all men please sing along with the men's choir, and all women with the women's choir. Another form of dialogue is verse with refrain. "Let my Prayer Arise" is sung in this fashion. The very beautiful Bortniansky trio is an old favourite in our parish as in many others. In this piece three voices (a trio of singers, as available on a given night) sing the verses while the congregation and clergy are kneeling in contemplation. Everyone sings the refrain between the verses. Don't forget that services begin at SIX pm this year. Please fast from mid-day, and bring some Lenten food to share if you are staying to break your fast afterward.